Every guitarist knows the problem, when turning down the volume pot the high frequzies say goodbye very fast. 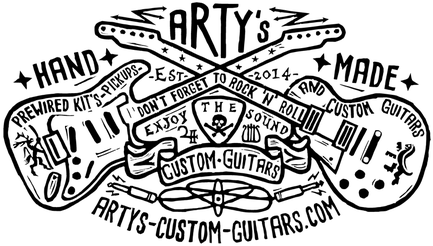 As a remedy there is a small simple circuit consisting of a resistor and a capacitor, which is soldered to the volume pot, the so-called treble bleed mod. The thing with the fixed treble bleed mod has only one catch, which resistor and capacitor is the right one? In various forums you can find innumerable suggestions for the supposedly right combination. In fact, the values of the components depend on countless factors, starting with the pickups, the length of the cable, the amplifier, the pots, and and and. One way to find the right values is to get a handful of different capacitors and resistors, and to try all variants until you have found the optimal values for yourself. This is extremely tedious and nerve-racking (I know from my own experience what I'm writing about), and secondly you should never change the guitar cable for a longer one, otherwise you'll have the perfect treble again. 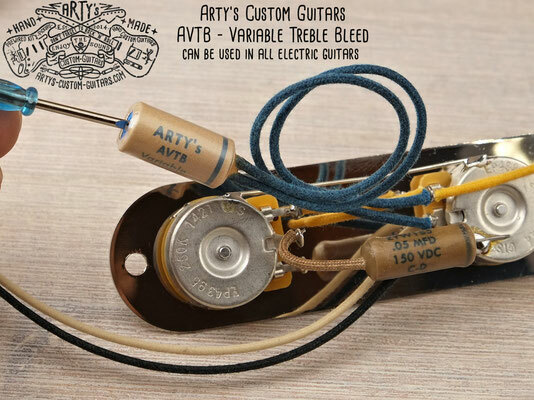 That's exactly where our AVTB - Arty's Variable Treble Bleed Circuit comes into play. The integrated circuit allows you to adjust the treble to your exact needs and circumstances with a small trimmer potentiometer, e.g. when the volume is only half turned up. If the volume of the guitar is fully turned up, the original sound remains unchanged. We have built the Variable Treble Bleed in vintage style with cloth wire, so it fits also optically well to our prewired kits. The assembly is quite simple. 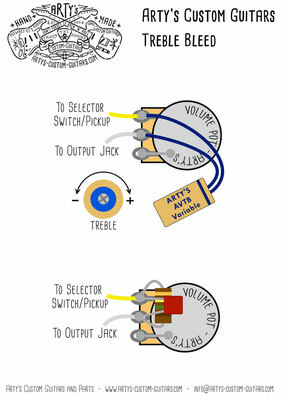 First the Variable Treble Bleed is soldered to the volume pot of your guitar, the wires are long enough to position the treble bleed outside the wiring cavity during adjustment. Then you build up your preferred setup with amplifier, cable etc., set the volume pot of the guitar to the desired volume e.g. 5-6, and the variable treble bleed pot to the middle position. If you play the guitar now, you should hear significantly more treble than with any treble bleed. To fine tune the treble bleed, turn the potentiometer counterclockwise using the supplied screwdriver for less treble, and clockwise for more treble. Once you've found the right setting, the variable treble bleed is simply stowed away in the wiring compartment, and that's it. The bandwidth of the AVTB - Variable Treble Bleed Circuit is designed so that it can be used for single coil and humbucker pickups. Included is a piece of Arty's Variable Treble Bleed, a mini screwdriver for the trimmer pot and a wiring diagram.